It’s nearly tea time and we’ve just knocked off having worked on a working bee proposition all day, so I’ve got to make the most of every minute between now and lights out because we’re going on a week’s stunt tomorrow and as I’ve got a couple of letters to write and quite a bit of sewing to do will be kept busy for a while. Your welcome letter arrived yesterday along with one from Ivy and another from Max Phillips. All three very cheerful and interesting. Youngster seems particularly bright and quite pleased with the prospect of Fergie sharing her house. That cutting you sent is rather interesting isn’t it. I suppose Gerry thinks because he wheedled them before he can do it again but I don’t think he’s got much of a chance this time. His line of talk won’t go down in wartime. Who are Labor endorsing? Frank Gaha was going to stand wasn’t he – but I never heard anything definite. This week has gone very quickly for us – we’e had quite a variety of work – two or three days making a football field. The army are going in for a lot of sport up here – we’ve got a battalion Rugby team and each company has a team too. It’s about the only thing they can do to keep the mob interested as there’s scarcely any entertainment and no social life at all. Then we put on a demonstration show for old Tom Blamey, Morshead and a few other big shots – a couple of days’ training and the week was gone. And of an evening the sergeants have been working making a log hut near the mess. It took quite a while getting started as everyone thought he knew more about it than anybody else – of about forty sergeants in the battalion, thirty nine wanted to be the architect and quite a lot of officers volunteered advice. However eventually we got it pegged out and the walls are taking shape. We worked on all yesterday afternoon and most of today. I’m putting in a big rock fireplace and I think it’s going to be extra good. The whole thing is the RSM’s idea to have pleasant and comfortable surroundings to drink beer in, when we get the beer during the winter, and although there’s quite a lot of interest being taken in the job, most of the chaps have doubts about our ever getting any benefit from it. Whenever we’ve decided to make ourselves comfortable the powers that disorganise our lives decide we need a change – however it’s interesting work. Max Phillips wrote quite a cheerful letter. He’s still very enthusiastic. He said he thought he must be camped near us though of course couldn’t state his whereabouts – however as he spoke of beer and towns and things like that I think he must be a long way away from here. Still I’ll drop him a line and we might be able to get together some time. I don’t know whether you remember Reuben Way. He went away with me in the Anti Tank. He was with our show through Syria and up till Nov 1941 when he transferred back to the thirty second. He came up to see us the other day and gave us some interesting accounts of Alamein. Rub can tell a good tale and make the most common place incident sound well. He had quite a lot to tell us about the other anti tank blokes who went to the thirty second when we were busted up in England. There was a travelling picture show here on Wednesday night – quite a good turn out – Fred Astaire and Ginger Rogers in the Story of Vernon and Irene Castle. Although I’d seen the show seven or eight years ago it was worth seeing again and made quite a good break in the routine. The unit diary indicates No. 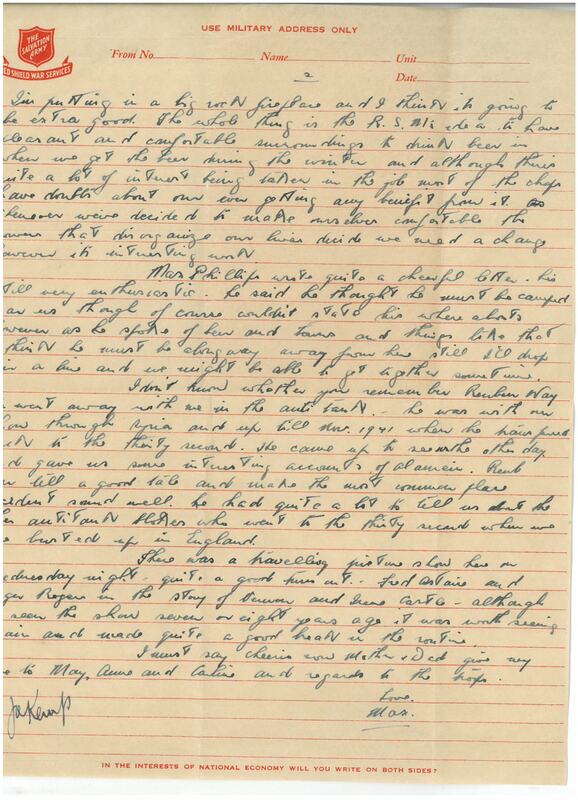 4 Platoon (Tank/ Attack) leave for 6 days exercise on May 24, so Dad must have been in this platoon. “Gerry’ was Gerald Mahoney who had held the seat of Denison from 1934 – 40 for the Labor Party. I assume the cutting was of this article published on May 17 http://trove.nla.gov.au/newspaper/article/25948930 which reports on Mahoney’s expulsion from the Labor Party by its state executive. The headline was ‘Mr Mahoney will not be silenced’ and included this quote: Members of the trades union movement and the Labor rank and file should not allow themselves to be pushed back because they did not dine and wine at luxurious hotels and drink their brains out. Mahoney stood as in ‘independent Labor’ candidate and the party endorsed Frank Gaha. From The Footsoldiers (p254): At this time the Battalion began to take a great interest in sports and passtimes. Football and hockey matches were played and bridge tournaments conducted. The football however treated the greatest interest – so much so that nearly three teams were playing from the battalion….All this was actively encouraged by Major Cotton. This competitive spirit was in a few weeks to see nearly the whole battalion walking miles to watch company, battalion, brigade or divisional matches. They would scream themselves hoarse barracking for their teams. 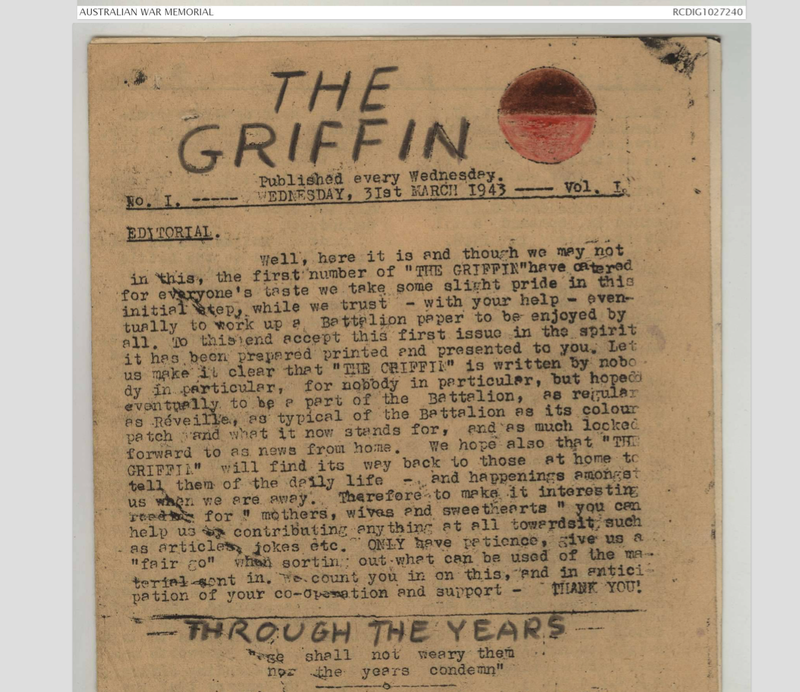 Let us make it clear the The Griffin is written by nobody in particular for nobody in particular, but hoped eventually to be part of the Battalion, as regular as Reveille, as typical of the Battalion as its colour patch and what it now stands for, and as much looked forward to as news from home. We hope also that The Griffin will find its way back to those at home to tell them of the daily life and happenings amounts us when we are away. Therefore to make it interesting reading for mothers, wives and sweethearts, you can help us by contributing anything at all towards it, such as articles, jokes etc. Only have patience, give us a fair go when sorting out what can be used of the material sent in. We count you in on this and in anticipation of your cooperation and support, Thank You. 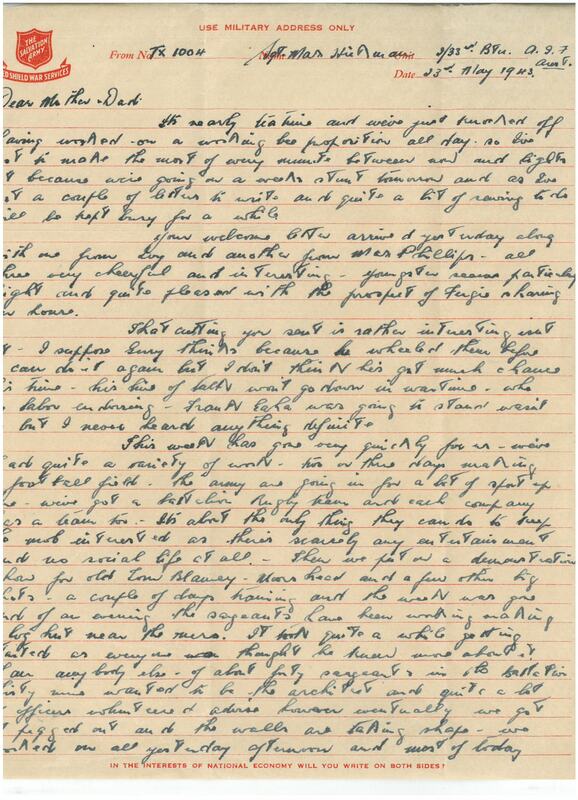 The Unit Diary records that General Sir Thomas Blamey visited the camp on May 20 and inspected anti-tank demonstration. 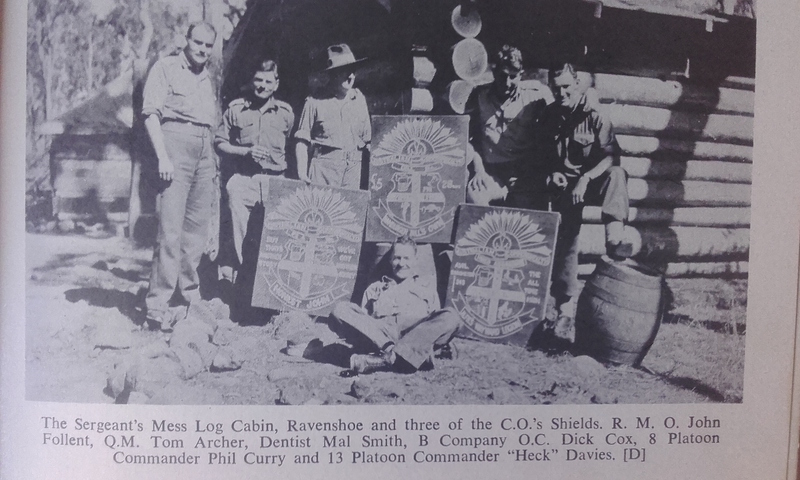 The sergeants really became active and on days off over a period of two months built a tremendous log cabin hut. It was 50 feet long and 18 feet wide. The trees used for it were ten inches in diameter and the gaps were caulked with mud and cement. Inside the cabin a six-foot high by eight-feet wide creek-stone fireplace was erected…..Max Hickman, a builder from way back, supervised the construction. Such was their spirit that on returning from a 30 or 40 mile, four or five days’ exercise the warrant officers and sergeants would set to and do some more work on the place to the accompanying cries and catcalls of the men of the battalion. 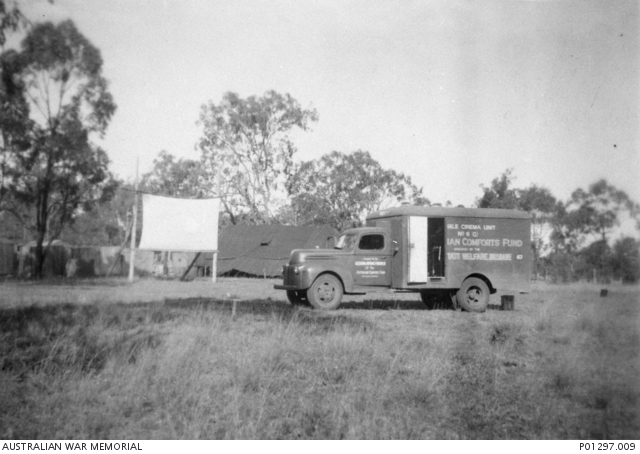 This entry was posted in Camps and Barracks, organisation, Tasmanian, training and tagged exercises, Reuben Way, sport, The Griffin. Bookmark the permalink.